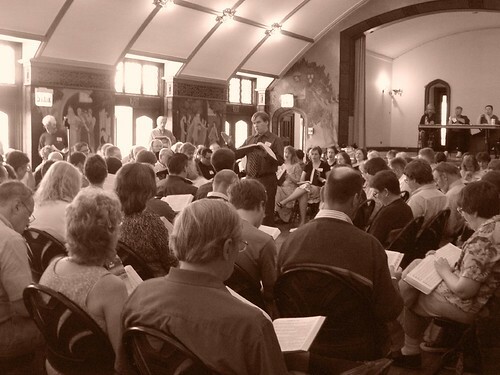 This website contains information about shape note (Sacred Harp) singing in Hyde Park and throughout the Chicagoland area. New All-Day singing in Illinois! The Midwest Convention will be held May 25-26, 2019, Saturday and Sunday of Memorial Weekend. Co-Chairs Eileen Ferguson and David Barford. New and experienced singers are invited to Chicago for the Midwest Sacred Harp Singing Convention. We sing 9:30 am - 3 pm each day, with dinner on the grounds at noon provided by local singers (local singers start thinking about what to bring!). This year we will sing from both the 1991 edition of the Sacred Harp and from the Shenandoah Harmony. Loaner books will be available. The Saturday evening social will be from 5-9 pm at the home of Kris Richardson, 4515 N Monticello. Our housing coordinator for the Midwest this year is Megan Dunning: mtadunning@gmail.com. Having trouble opening one of those links? Try right-clicking and opening it into a new tab or window. Some of them are cranky with certain browsers. Thanks: University of Chicago (hosting), Will Fitzgerald (design), Jessica Beer (photography).